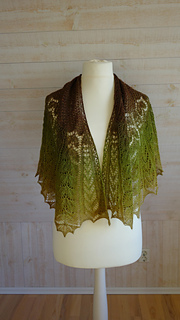 A two colour version of this shawl is available for free if you buy this one. Add this one to your basket and the two colour version will be added for free automatically. Difficulty: Medium to advanced. Pattern on every row. Charts only, no row-by-row written description. 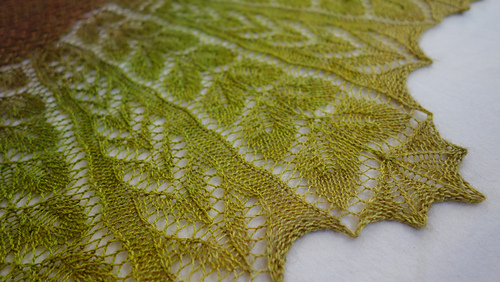 Yarn: Farbmasche Yak 800, merino/silk/yak 60/20/20 %, 875 yards (100 m)/100 g. Colour used here is called Foliage. Almost the entire skein was used to make the size as shown, only 7 g remained. 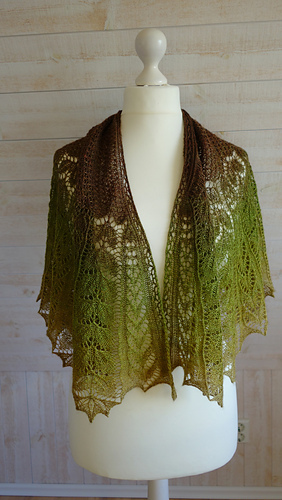 Size is adjustable, so you can work it using both more and less yarn according to how large a shawl you want. Size: As shown 27.5 inches (70 cm) deep and 55 inches (140 cm) wide. 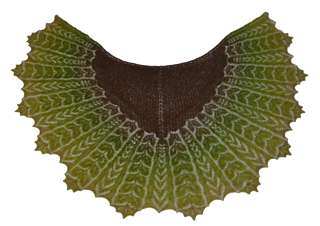 Size is adjustable, you can work any number of stitches divisible by 98 + 34. Chinese Waitress Cast on with crochet hook (optional).